To gem historians, judging by the reaction of the press, and to the general public as well, it is always something of an event when the existence of an unusual stone, up till now known only to a handful of people, becomes more widely known. 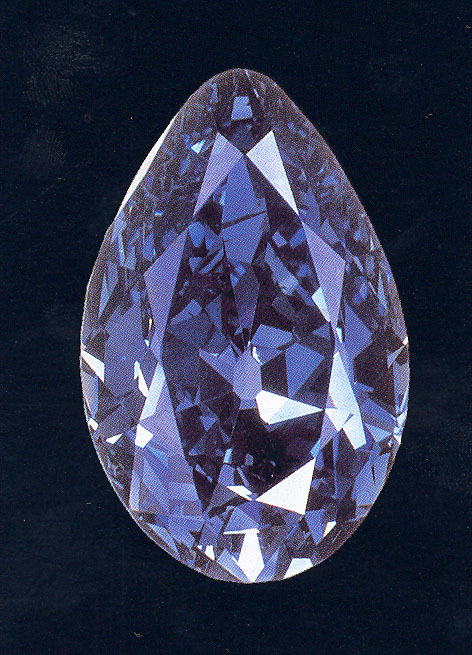 That is what occured in 1984 when Christie's announced that they would be auctioning this fancy blue pear-shaped diamond weighing 42.92 metric carats, the fourth largest recorded blue diamond (The stone might actually be the 5th or 6th largest blue diamond as of the present -- it is true, however, that in 1984 it was indeed the 4th largest, a title which it held for about a decade or so). The original owners of the gem were the Tereschenko family. They were sugar-kings in pre-communist Russia. One member, Mikhail (1886-1956), who held advanced political views, became Kerensky's Minister of Foreign Affairs in 1917. Four years before, Mikhail had deposited the diamond with Cartier in Paris. In 1915 he instructed Cartier to remount the gem as the centerpiece in a necklace containing a variety of fancy colored diamonds. 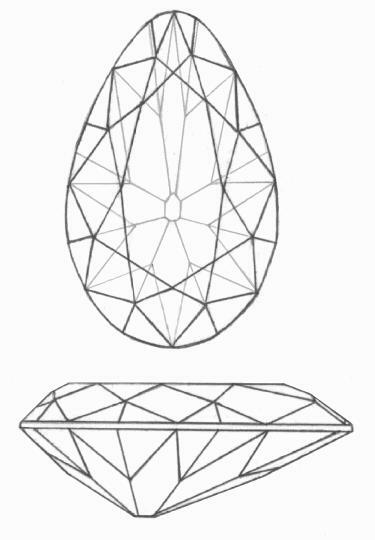 The jewel was unique in combining forty-six marquise, round, pear and heart-shaped diamonds ranging from 0.13 to 2.88 carats. Their colors were described as "jonquil, lemon, aquamarine, sultana-green, golden button, grey, blue, crevet, lilac, rose, old port, madeira and topaz." As such, the necklace ranked among the most important creations of this century in fancy colored diamonds. In 1916, on the eve of the Russian Revolution, the Tereschenko Diamond was secretly taken out of Russia and then passed into private ownership. Like other fancy blues, the Tereschenko belongs to the rare group of Type IIb diamonds. It is not known where it was found: theoretically, it may have come from either the Kollur alluvial deposits in India or from the Premier Mine in South Africa. However, by 1913 the Premier Mine had been in existence for barely ten years and since there is no report of it having yielded such a rare and unusual gem, it must be assumed that the diamond is of Indian origin. Days before the sale in Geneva, four dealers contacted Christie's seperately, offering to buy the diamond directly at the estimated price, between three and four million Swiss francs, thus saving at least the 10% charge added to the selling price. Christie's refused the offers. In addition, a group of diamond dealers suggested that the auctioneers ought to have the diamond graded by the Gemological Institute of America. They pointed out that while the report of the Swiss laboratory in Lucerne mentioned in the sale catalog was impeccable, it would make commercial sense to have the diamond graded by the GIA because its certificate was better known, particularly in Asia and the Middle East. A sale would thus be made easier in those regions. Christie's duly obliged: the diamond was flown to the GIA laboratory in New York and was returned with the necessary documents. don't match the side-view drawing, but you get the general idea. The Tereschenko came up for sale on November 14th, 1984. At 10pm excitement ran high in the brightly lit ballroom of the Hotel Richmond in Geneva when the Chairman of Christie's announced: "We are now selling Lot 454. We shall start the bidding at three million Swiss francs." The price didn't seem to surpise anyone in the room, which was full of important dealers from all over the world and several billionaires, too. It took 40 seconds for the bidding to reach 6.5 million Swiss francs, a figure far in excess of Christie's most optimistic estimate. Ultimately the auctioneer brought down his hammer when a shout of "Ten million Swiss francs" came from the back of the room. Robert Mouawad, Saudi diamond dealer, had added a new stone to his growing collection for $4,508,196. Sources: Famous Diamonds by Ian Balfour and The Fancy Colored Diamond Index.